Martin Bricelj is a media artist and a cultural activist. Co-founder of CodeSign Artworks, studio for Visual CommuniAction and of the multimedia society Code.Ep, he organizes audio-visual events and exhibitions in Slovenia and abroad. He has exhibited in many galleries and spaces worldwide: ICA in London, Sonar in Barcelona, Columbia University in New York, Centro Cultural Recoleta in Buenos Aires, Kunsthaus Graz, Kaapelithas in Helsinki, Museums Quartier in Vienna and many others. His work has been reviewed and published by boingboing.net, Pecha Kucha, the New York Art Magazine, Harper Collins, El Pais, Actar, Mladina and others. Martin Wheeler is a games-designer, electronic musician and one of the original 'computer geeks' – publishing his first game in 1984 at the age of fourteen. At sixteen he began working as a designer for Virgin Games and went on to develop over twenty five games on systems including PC, SNES and Nintendo Game Boy. In 2003 he started a new career in electronic music, releasing his first single as Vector Lovers and signing to seminal Glasgow label, Soma Records later the same year. He has since recorded three albums and has performed live at venues and festivals across Europe including Fabric (London), Arena Berlin, The Loft (Barcelona) and Syncfest (Athens). Ein kühnes neues Projekt, das die Beziehung zwischen virtueller Realität und unserer Wahrnehmung von uns selbst und der Gesellschaft dokumentiert. Diese Installation erlaubt einem globalen Publikum, reale Orte aus der Entfernung zu erforschen und mit den Objekten und Menschen an diesen Orten durch Echtzeit-Kontrolle eines menschlichen Test-Subjektes zu interagieren. Dort wo digitale und physikalische Welten kollidieren werden die Grenzen zwischen Selbst und Anderem, Realität und Simulation fortwährend in Frage gestellt und neu definiert. A bold new project documenting the relationship between virtual reality and our perceptions of self and society. 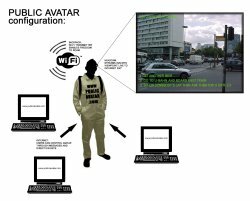 This installation will allow a global audience to explore real-world locations remotely, and to interact with objects and people in those locations through real-time control of a human test subject. As digital and physical worlds collide, the boundaries between self and other, reality and simulation are constantly challenged and redefined.